Few breakfast items transcend the sum of their parts quite like the humble pancake. Through some magical feat of morning alchemy, the simple combination of eggs, powder, and sugar creates a steaming platter that's both fluffy and crispy, sweet and savory, and capable of soaking up a seemingly infinite quantity of syrup. 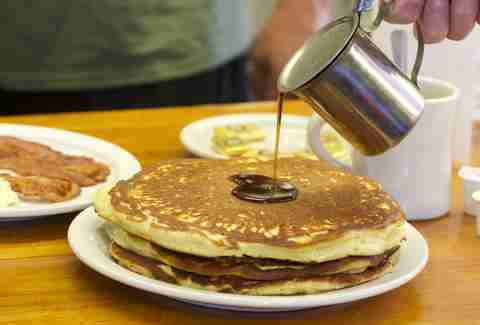 To salute this breakfast of champions, we've compiled a short stack of 21 of the best pancakes America has to offer, ranging from simple diner flapjacks to monstrous morning mash-ups. Read on to devour them all, and if we missed your favorite, let us know in the comments. Even on a weekday afternoon in the middle of an NYC summer heatwave, people line up along Clinton St for the privilege of digging a fork into the fluffy heart of their not-at-all-short stacks. Should you happen in during February, they flip up Pancake Month specials like Japanese pumpkin or Swedish apple, but the year-round offerings are special enough on their own to regularly earn "best in the city" accolades. The wild Maine blueberry is a fail-safe pick, topped with a crown of pureed fruit whose sweetness is amplified even further when combined with a pour of just-warm-enough maple syrup. Note: This entry was written by special guest pancake journalist David Carlisle, the father of our Editorial Director’s girlfriend. 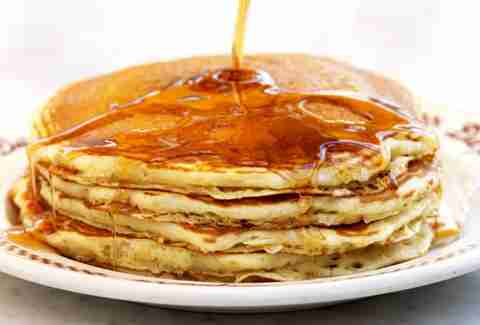 I had my first Roadside pancake about 11 years ago, and remember it as if it were a long lost brother. The Roadside is a halfway house for folks with mental illness run by Gould Farm, a magical organization. There was a crude sign on the wall illustrating the different pancake sizes, which confuses most people, since it relates to circumference, not stack height. The waitress tried to talk us out of the large, warning that it was a lot of pancake, but met with no success. A long time passed -- the wait at the Roadside, and the service, are iconic for those of us who live nearby. When it came, it was seriously about the size of a large pizza. They give each pancake a small reservoir of maple syrup that should suffice for an average human being; I poured on all of mine, then grabbed my wife’s and poured that on as well. All that covered only a quarter of my massive pancake, so that’s all I ate, and still became senselessly stuffed. One of our top breakfast spots in the nation, The Laundry's churning out great cocktails, baked goods, and breakfast innovation smack in the palm of the Mitten, mixing small-town charm with a global array of flavors. The star of the robust breakfast menu is a trio of hotcakes that includes the banana-packed Fat Elvis, strawberries & cream, and our favorites, Brie and bacon, which balance the savory cheese and swine with apple cinnamon compote and maple syrup. 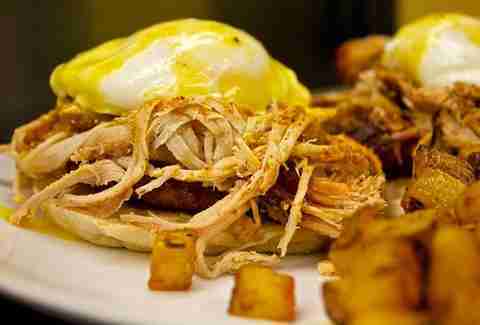 Pair it with a mimosa and you've got Michigan's answer to Nyquil. Nothing says New York quite like a neighborhood diner, and Tom's is one of the best. Since 1936, it's been everything the Prospect Heights neighborhood could ask for, and in return it garners around-the-block lines of hungry flapjack fanatics. Silver dollars, mango walnut, and sweet potato round out a surprisingly elaborate pancake menu that is perhaps the best $7 you could spend before noon. We love BBQ. And we love pancakes. But too often, we have to choose between the two. No more, now that this Milwaukee shop has played breakfast Tinder and hooked the two up. Sweet potato pancakes at Smoke Shack come two ways, both of which are essential eating. Though if we had to choose, we'd have to go with the savory stack topped with pulled pork and Carolina mustard sauce. The sweet ones --with mascarpone whipped cream, toasted pecans, and apple syrup -- make a hell of a dessert, though. Sure, there's nothing wrong with a chef-driven hotcake topped with foie and stuffed with foraged salmonberries, but Uncle Bill knows not these things. The Jersey Shore institution is a cheerful family destination for destroying hunger after soccer games, church, or any activity that benefits from an aperitif of griddled batter. It's charmingly cash-only, the diner mugs are so thick they could break a windshield, and its scrapple is worth the trip alone. But the main draw is obviously the gloriously well-made pancakes, of which it has nearly 15 varieties ranging from potato to blueberry to the classic buttermilk, whose recipe hasn't changed for 40 years (and hopefully won't for 40 more). It's a cliche to say certain places make it feel like you've "stepped back in time," so we'll just say that when you see the burnt-orange stools and wood paneling at Village Coffee, you'll feel like you've stepped into Boulder circa 1971, when the joint opened and unleashed the same pancake recipe used today. There are but three pancake varieties here: buttermilk, blueberry, and chocolate chip. All are the size of a dinner plate. Pair 'em with eggs or bacon, or just show up on the weekend when they sometimes serve a "mancake special," where they stuff their enormous pancakes with bacon, ham, and sausage. If you ask nicely, they can also prepare it whenever you want. The Inn on the Gallatin might look like a Bates-y little row of cabins and RV spots on a stretch of a river in the middle of nowhere, mainly because that's exactly what it is. But the cafe in the faux log cabin lit by the neon vacancy sign pops out some of the best damned breakfast in the state, a mix of comfort food and honest-to-goodness fanciness that's as unexpected as it is delicious. The classic Benedict is great, but the pancakes are the clear winner here (also, this list is about pancakes! ), stacked up old-school buttermilk-style, loaded with blueberries and pecans, or French-style in the form of banana/Nutella crepes. Save room for a fresh-baked cinnamon roll, which is best eaten on the banks of the river. Some people say that a pancake is just a pancake. Those people also probably relish in telling toddlers that Santa Claus is really just the Easter Bunny in a costume. And they also haven't been to this legendary Nashville spot, where locals and tourists alike line up for a whopping 23 different pancake choices. The menu includes everything from crepes to buckwheat, banana bread, and Swiss chocolate cakes, plus two fantastic takes on potato pancakes -- one savory, and one made with sweet potatoes and covered with cinnamon-cream syrup. New Orleans is a city that doesn't shy away from fried things or powdered sugar, as evidenced in its world-renowned beignets -- which means you know that its pancake game doesn't play. The city's best cakes come from Coulis, a Latin-influenced diner whose short stack is one of this list's tallest and sweetest, such that it tastes only a half step away from a funnel cake, especially thanks to the extra-heavy dusting of powdered sugar. 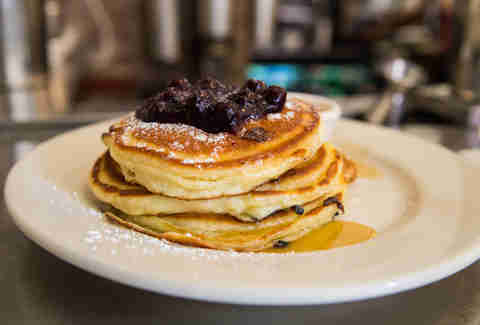 The Original Pancake House is perhaps the only James Beard-lauded chain in history, and the North Shore location earns our props for taking that franchise name and turning it into a truly beloved neighborhood joint with a charm all its own (and outselling every other iteration of the chain in the process). 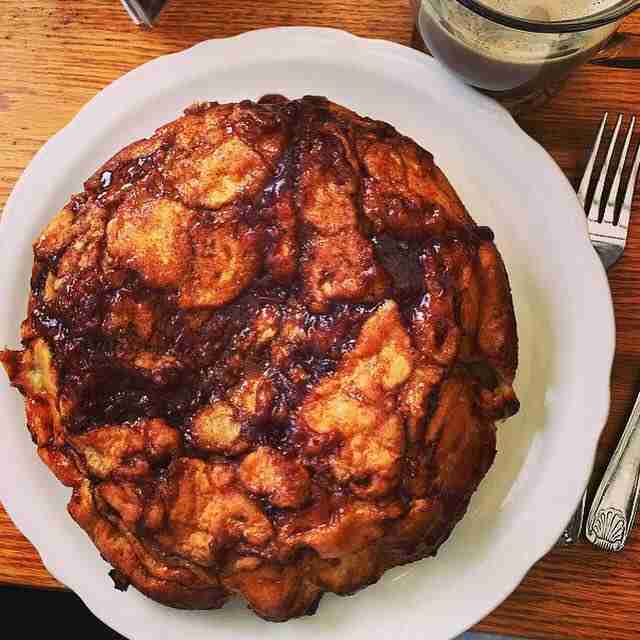 Every pancake there is a star, but the must-order is the apple pancake, which features sautéed apples and cinnamon baked onto the top. They're so popular that Walker Bros. even sells a frozen version to take home. Firmly on the Charleston foodie map, Hominy Grill does a lot of things right. From iconic Americana like shrimp and grits to the gut-busting Big Nasty fried chicken biscuit, this is not a brunch spot for the faint of artery. And while biscuits and grits are crucial members of the Southern breakfast canon, the third of the holy trinity is surely the flapjack, of which Hominy's buttermilks are a sterling example. Wildberry's Chicago location (there are a couple in its suburbs as well) is situated perilously close to the nexus of all things touristy that is Millennium Park, but it delivers the kind of breakfast artistry that you'd happily seek out anywhere, even if you DID just blindly stumble in there after taking a selfie at The Bean. As you'd expect, berries figure prominently into the pancake toppings (the signature cakes combine vanilla anglaise, blackberry coulis, and berry mascarpone with fresh berries), but it's far from its only move. The whole grain fig & walnut version has some dignified sophistication without sacrificing deliciousness, and the Oreo S'More cakes are basically a 5-year-old's breakfast fever dream. Also, don't sleep on the Rocky Mountain Crepes (like if a thin pancake swallowed a Denver omelette) if you're one of those people perpetually torn between sweet or savory. Chocolate chip cookie dough pancakes. Yes. Pancakes, stuffed with cookie dough, drizzled with chocolate, and topped with whipped cream. If that's not enough for this old-school diner to win you over, you're an idiot. 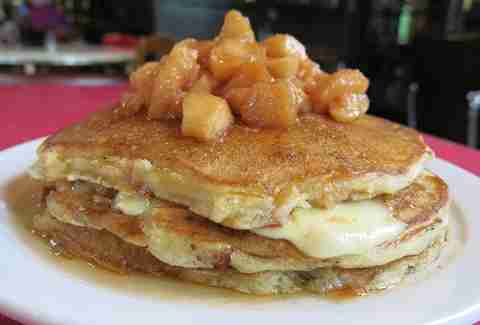 But you're an idiot who can also get down on pineapple upside-down pancakes. At 99% of restaurants in America, pineapple upside-down cakes alone would be enough to win us over. But this place has cookie dough pancakes, so we can't even think about those other ones. And we don't want to. Slappy Cakes is kind of like Korean BBQ, except instead of pretending you know how to not undercook pork belly on a tabletop grill, you make pancakes on a tabletop griddle. It's basically a choose your own adventure, only instead of falling into a pit of spikes, you get a pancake loaded with the add-ins of your choosing. You start with a batter -- from buttermilk to chocolate to whole grain, if you hate fun -- then let rip on add-ins ranging from bacon to cheese, almonds, cherries, and butterscotch. 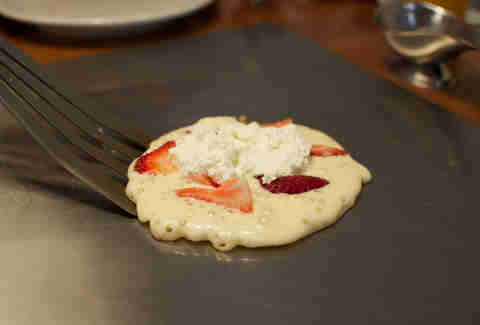 It's a wonderful concept, and one that's seen Slappy Cakes open a few locations in SE Asia. Not Korea, though. Which is a shame. Because pork belly pancakes sound great. Batter alone can only take you so far. A hotcake is nothing without its sugary liquid soulmate, a fact that nobody knows better than fifth-generation syrup-makers like Benton's. Its restaurant started as a dedicated outpost to sell its syrup, so be sure to take home a bottle, but not before submerging a platter of its peaches & cream cakes in warm New Hampshire maple juice. Chef Tim Byres is so good at playing with fire that his how-to book scored a Beard award, so you'd be remiss to ignore the meatier items on his signature restaurant's brunch list (pulled whole-hog BBQ Benedict! 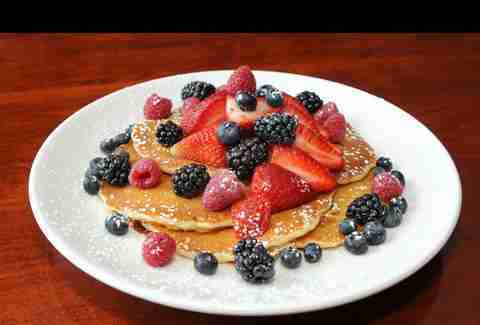 ), but even sans smokey protein, his pancakes have become one of the most iconic brunch dishes in Dallas. 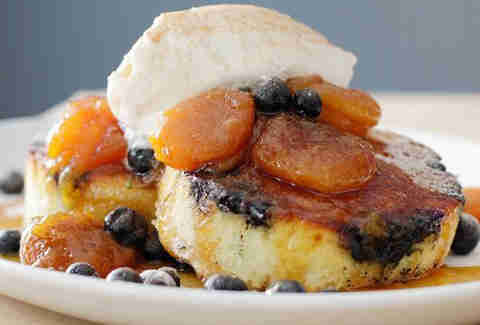 The blueberry and house-made ricotta hotcakes score a 10 on the indulgent meter, then break the scale thanks to a generous topping of vanilla-poached apricots and heavy cream. 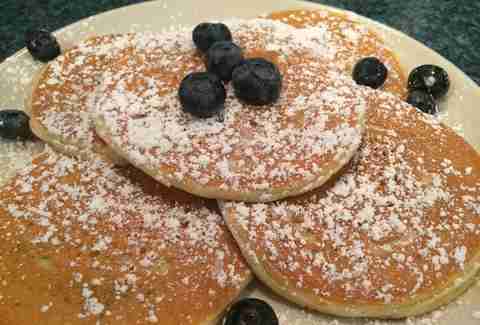 Traditional pancakes at this Seussical Philly classic come piled high with everything from chocolate chips to strawberries, blueberries, and ice cream. But screw all that. Because if you care about pancakes -- and clearly, you do, since you’re reading this -- it's all about the red velvet pancakes. These bright-red suckers come layered with mascarpone and capped with whipped cream. How good are they? This menu also includes short-rib Benedict and crème brûlée French toast, two items we don’t even want to try if it means sacrificing the pancakes. 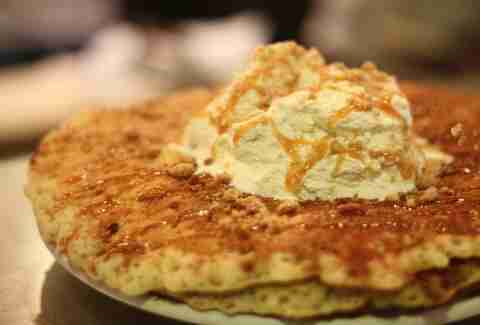 This Hollywood institution's wait is as brain-numbing as a Sandler vehicle, but its massive flapjacks are stuffed with stoner-friendly filler that's very worth two hours of your time: Oreos, butterscotch chips, and Frosted Flakes all make appearances on the expansive pancake menu. There are nearly 20 different options that you won't find anywhere else, from the Saturday Morning Fever (Bailey's and Kahlua batter) to the Golden Ticket (brown sugar-baked bananas topped with caramel, walnuts, and streusel). If you cruise Duval St on any given Sunday morning, there'll be a lot of smells you'd wish you could un-smell. The best way around it? Head a few blocks over to Blue Heaven, where the smell of fresh-baked breakfast entices you from down the street. If your hangover can handle the wait, you'll be seated in its funky, shady backyard, where you can chow down on Richard's Very Good Pancakes. They're probably the best in Florida, made from scratch, and served with bananas, pineapple, pecans, or blueberries... nothing is better at soaking up the remnants of a rough night in Key West. For seven decades, this old-school, multiple-location, 24-hour diner has been good for one thing, and one thing only: checking out old-lady waitresses! OK, two things: checking out old-lady waitresses and award-winning, ultra-fluffy pancakes, which (no surprise) taste best at 3:30am, when they're served by an old-lady waitress. 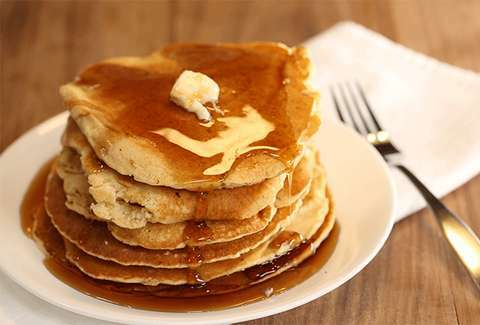 A full stack is a heaping pile of five cakes; don't skimp on the boysenberry syrup. Dan Gentile is a staff writer on Thrillist's national food and drink team. He once ate seven pancakes at an IHOP bottomless pancake-eating contest, but it just wasn't enough. Follow him to more gross high school stories at @Dannosphere.